Students interested in learning more about Truman Scholarships and other prestigious awards should contact Megan Friddle in Emory's National Scholarships and Fellowships Program. Lamar Greene, an Emory University junior who has delved into projects to reduce health care disparities from the moment he arrived on campus, has been named a 2018 Harry S. Truman Scholar. He is among just 59 college students across the United States to earn the highly competitive national honor, which is granted to exceptional students in their junior year who have demonstrated outstanding leadership, academic excellence and a commitment to a life of public service. Greene, a human health major in Emory College who also is completing the concentration in health innovation offered through Goizueta Business School, is Emory’s second Truman Scholar in two years. As part of the award, which is administered by the Harry S. Truman Foundation, he will receive $30,000 for graduate study as well as professional development for a career in public service. 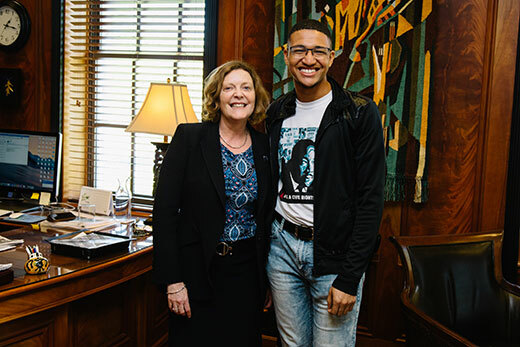 “Through his advocacy for better access to life-saving health care, Lamar has brought positive changes both to our campus community and to the broader Atlanta community,” says Emory President Claire E. Sterk, who summoned Greene to her office April 11 to personally deliver the news. A Gates Millennium Scholar, Greene had planned on becoming a doctor until two events converged in high school to change his focus. For two summers in high school, he studied the risk factors of heart disease, and how to prevent it, as an intern in a cardiovascular lab in his native Richmond, Virginia. That second summer, the very measures he was studying in the lab came to life when his grandmother needed emergency double-bypass surgery. As a black woman, his grandmother was failed by the health care system, Greene says. That human focus and interest in medicine were an ideal fit for Emory’s Center for the Study of Human Health, where Director Michelle Lampl recalls Greene arriving ready to fully engage. He dove right into coursework, including Lampl’s predictive health class, joined the center’s Student Advisory Board and joined the center’s News Team, writing regularly for the center’s blog, DestinationHealthEU. He stands out, she says, for his authentic commitment in and out of class to living a “purposeful” life and exploring every opportunity available. For instance, after his study abroad experience with the Emory Tibetan Mind/Body Sciences Program, he reflected on how the resiliency of Tibetans in exile could translate to marginalized populations in the U.S.
Greene’s experience with his grandmother and coursework reinforced his focus on the scientific basis for prevention. His volunteer work with Emory’s Resource and Insurance Navigation Group, where he helped low-income patients at Grady Memorial Hospital secure insurance, drove home the value of humanizing the issues. Kevin Humphries Jr., now head of the men’s health initiative at the DeKalb County Board of Health, was Greene’s supervisor at Grady. He watched him tackle dozens of calls with patients every day, following up to ensure they paid their first premium installment to guarantee coverage. That humility and focus on mission, combined with his academic talent, propelled Greene to success as the summer health intern at Emory’s Office of Health Promotion. Tasked with finding ways to increase the use of pre-exposure prophylaxis, known as PrEP, for HIV prevention among students, he exceeded the expectation he would simply develop promotional materials and help conduct outreach with campus groups. His lasting legacy: a training session for clinicians working in student health. As a self-described queer black man, Greene wanted the doctors to confront their biases in ways that let them connect with patients and better determine how to prescribe, and increase adherence to, PrEP. He was just a rising sophomore when he conducted the training, which included answering sensitive questions and challenging skepticism from a room full of student health doctors and clinical providers, many of whom began their careers began before he was born. “He was remarkable,” says Michael Huey, the Student Health Services executive director who has since used part of the training, with Greene’s permission, in a presentation to the American College Health Association. Greene’s hard work so far has only affirmed his belief that staying positive can help influence change. He stayed upbeat about his focus this week, when the Truman Foundation was expected to announce scholarship winners, by wearing a different health-focused T-shirt each day. He was wearing his shirt featuring the image of Martin Luther King Jr. emblazoned with the words “AIDS is a civil rights issue” when he met with Sterk. He had little time to bask in the honor before he needed to head to class. He is also working with the Office of Health Promotion on the university’s national college health assessment. The report will be completed this spring, with recommendations planned for each Emory division next fall. Greene will intern at Deloitte Consulting this summer, looking at change management issues to understand the business side of his health care interests. He also must finish his honors thesis, examining racial disparities in maternal health. That work has him thinking about the health inequalities that literally begin in the womb, with chronic conditions more likely among those with a rough start at birth. He is considering applying for graduate study in Stanford University’s program in community health and prevention research to further examine the issue. He may also take a gap year before graduate school, perhaps studying funding issues in health care or working in the field on various projects. Regardless of his next step after Emory, his goal will be the same.